In mammals, melatonin plasma levels are high during darkness at night and low during the day. 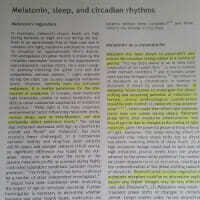 Even in an environment free of time cues and in constant dim light, melatonin continues to express its circadian (or ‘approximately 24-h’) rhythm. This endogenous circadian rhythm is driven by the circadian pacemaker located in the hypothalamic suprachiasmatic nucleus (SCN), via a multi-synaptic pathway involving the spinal cord and the sympathetic nervous system.1,2 Light exposure during the night can acutely suppress melatonin levels.